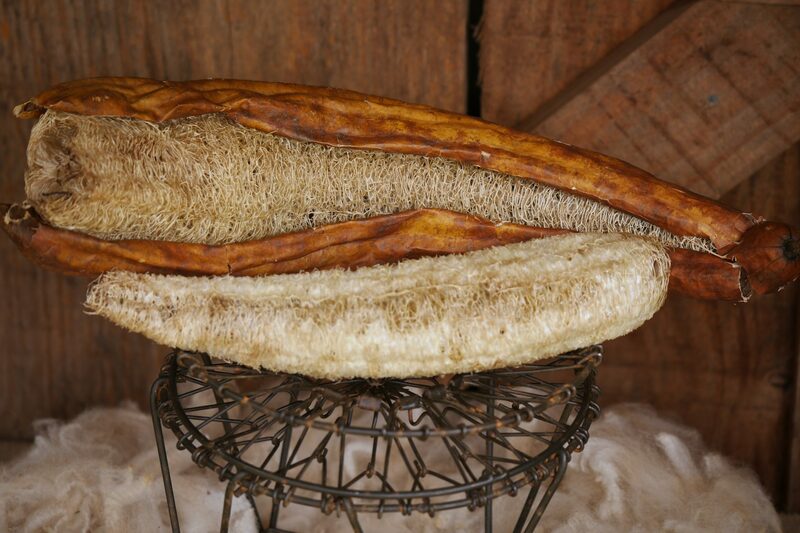 The luffa sponge is synonymous with luxury. While I've seen them in luxury boutique stores, I always assumed that they grew in the ocean. My world was turned upside down when I visited another alpaca farm in south Georgia and learned they were planning to grow luffas this spring. After the shock wore off, I did some research. Within days I had seeds delivered and I started my own luffa adventure. They grew like kudzu. 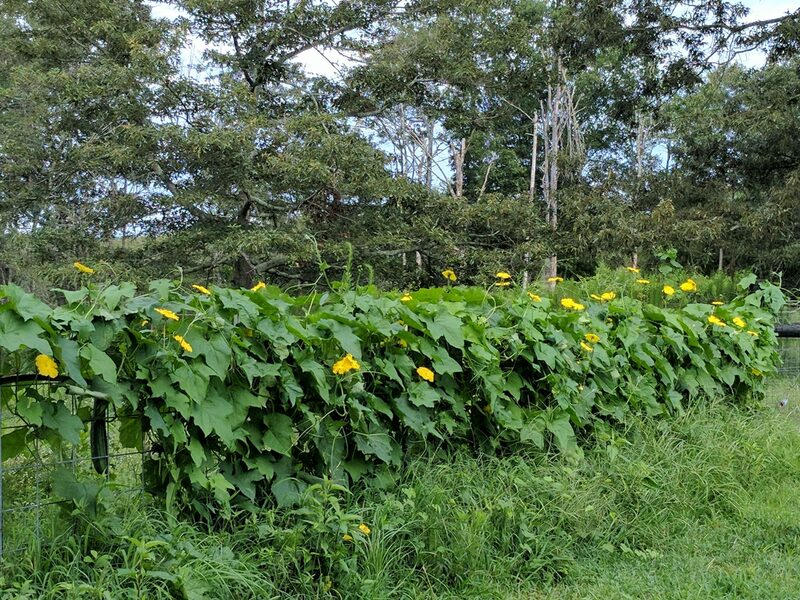 We planted 10 seedlings in the spring and harvested over 100 foot-long luffas by November. Others have reported less spectacular results, but this is the step-by-step explanation of how you can do the same. 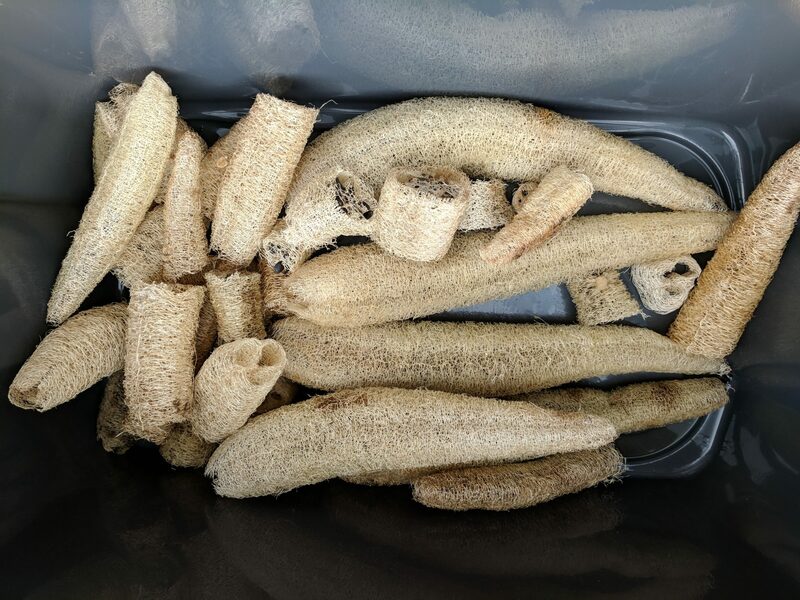 There are many different variety of luffa, some grown for food and others grown for the sponge. I chose a variety that is most commonly grown commercially for luffa sponges around the world. 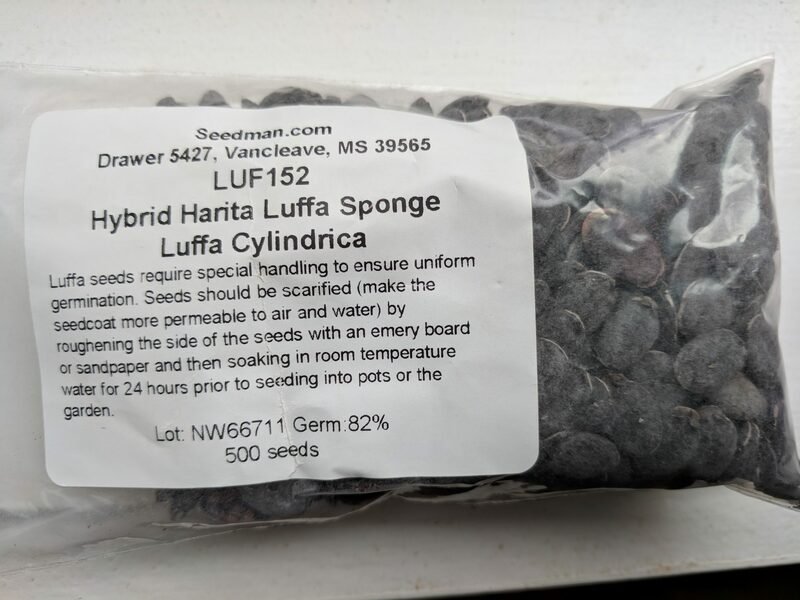 I ordered them from seedman.com and purchased a package of 500 Hybrid Harita Luffa Seeds for around $25. Seeds ordered around April 30 and arrived a few days later. 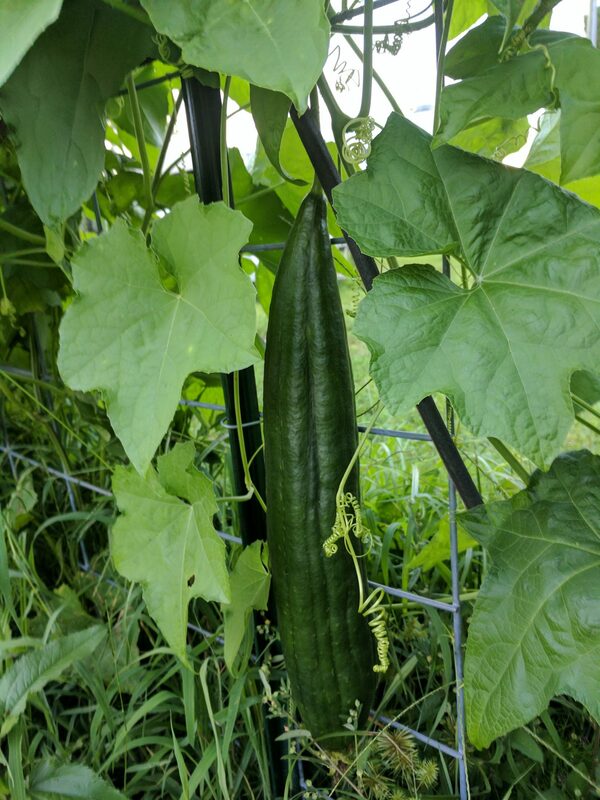 Luffa's require a long warm growing season. You don't want to plant them until the danger of frost has passed in the spring, but to provide the longest season possible, you really want to have seedlings hardened and ready to put in the ground. Prepping the seedlings was the most work of the entire process. 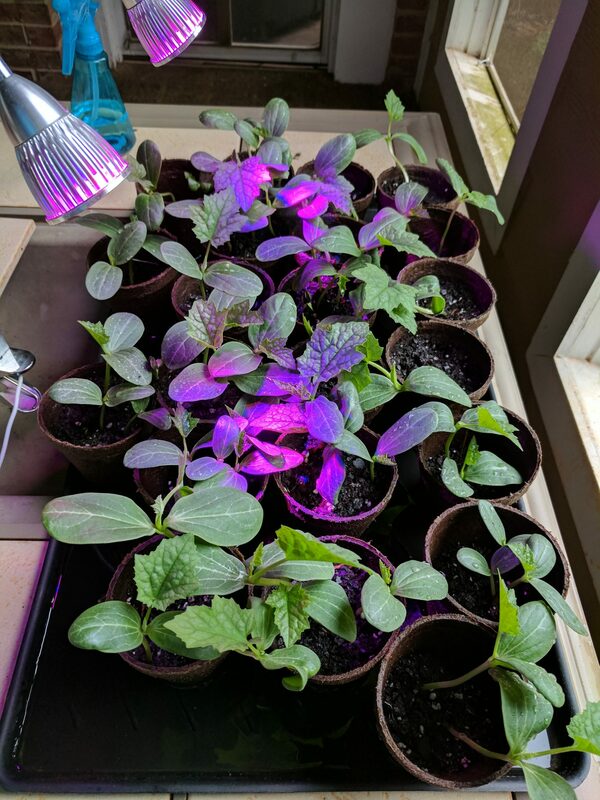 I started preparing the seedlings indoors around the first week of May. 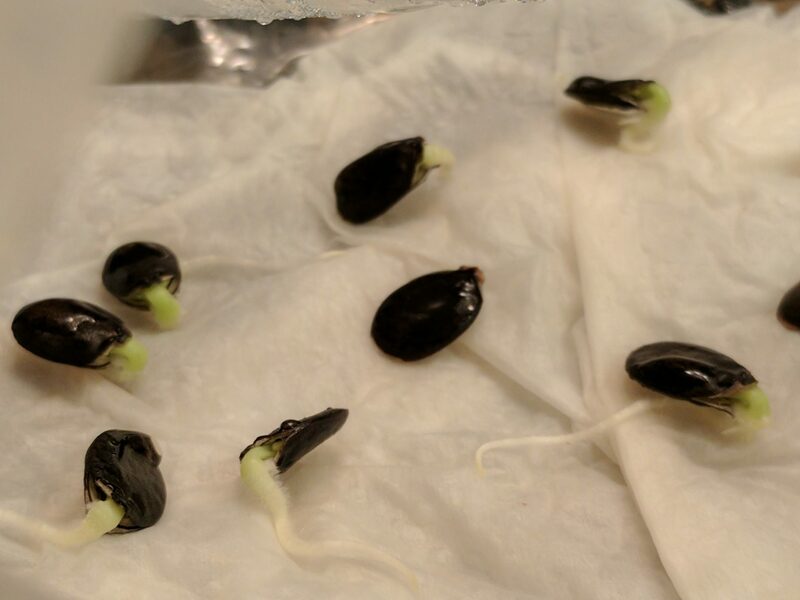 To improve germination rates you want to scarify (scratch up) the outside shell a little, using an emery board, and soak them in water for 24 hours. Next, wet a paper towel, put the seeds on that wet paper towel, and seal them in a Ziploc bag. I put the bag on a seedling grow mat, and a day or so later all seeds had sprouted. Next I took the sprouted seeds and placed them in fiber grow pots filled with fertilized potting soil. 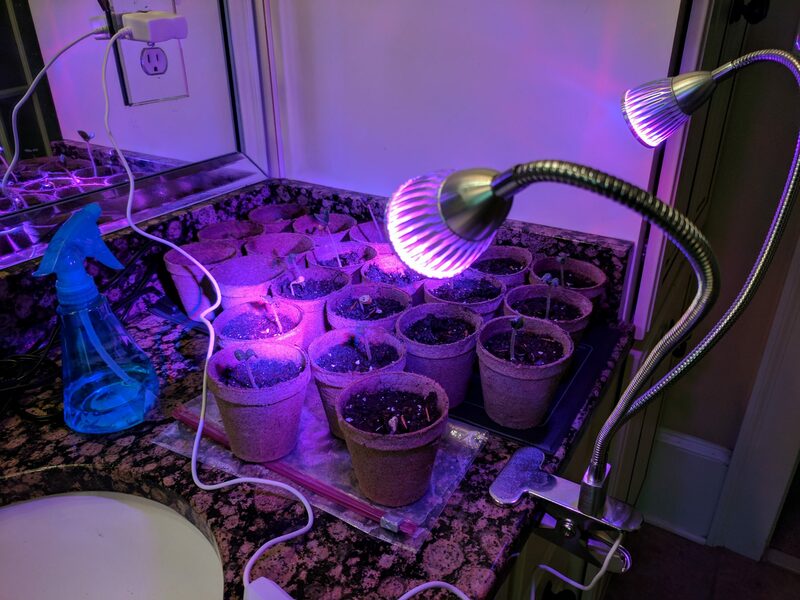 The pots were placed on a seedling grow mat and I had UV grow lights on a 12 hour timer. This provided the warmth and UV light needed for the seedlings to grow. I watered the soil whenever it felt dry. This could sometimes be a couple times per day because the warming pad would dry the soil. Before planting the seedlings, they need to adjust to outdoor temperature and weather. 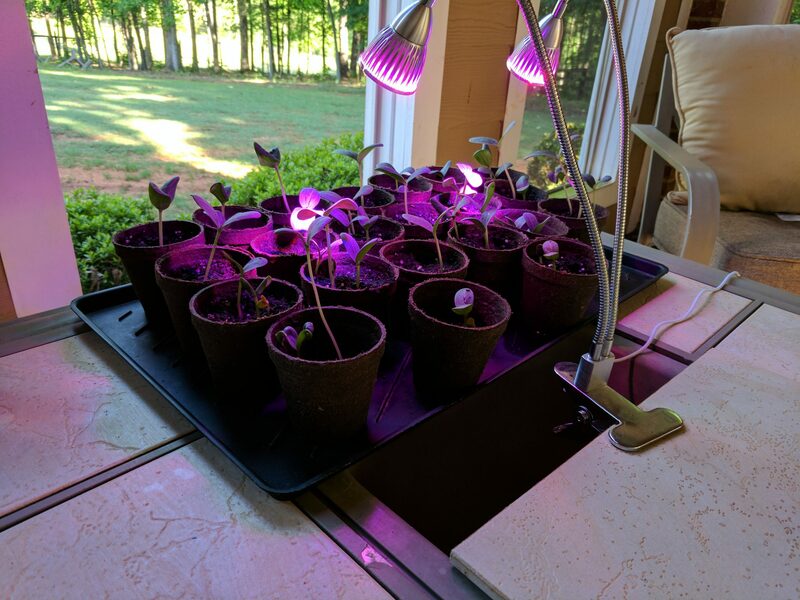 After almost a week of indoor growing, I took the seedlings to the screened porch and let them get accustomed to outside weather. I continued both the grow light on a timer and regular watering as needed. You want to let the seedlings grow until their first real leaf emerges and then they'll be ready to plant. After about a week, the seedlings have hardened and their first real leaves have matured. These leaves are different from the round seed leaves that emerged from the seed. We planted multiple seedlings per pot, just in case some didn't make it, but they all did. Luffas require full sunlight and lots of water. 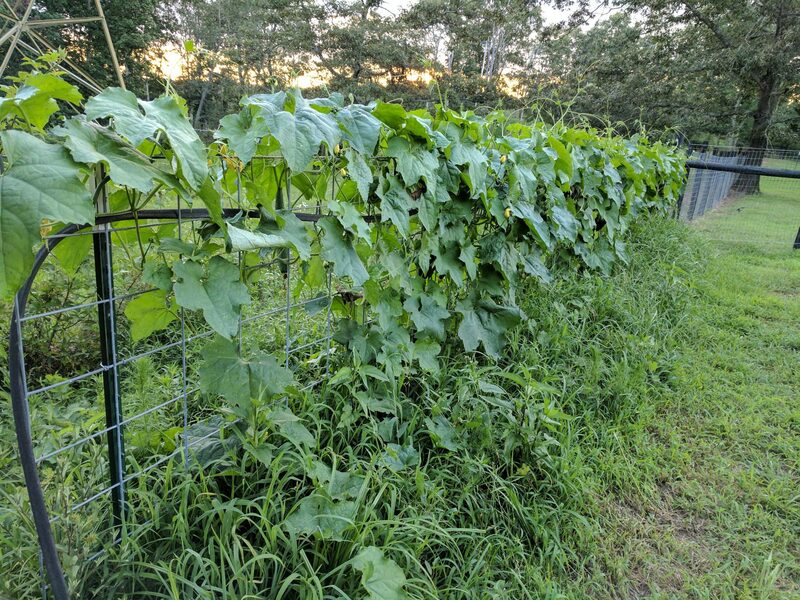 We used 6 t-posts and 3 cattle panels from Tractor Supply (around $85) to make the growing trellis for our luffa vines. I also ran a soaker hose through the top row of the cattle panel so that we could water the loofa vines when there wasn't rain. 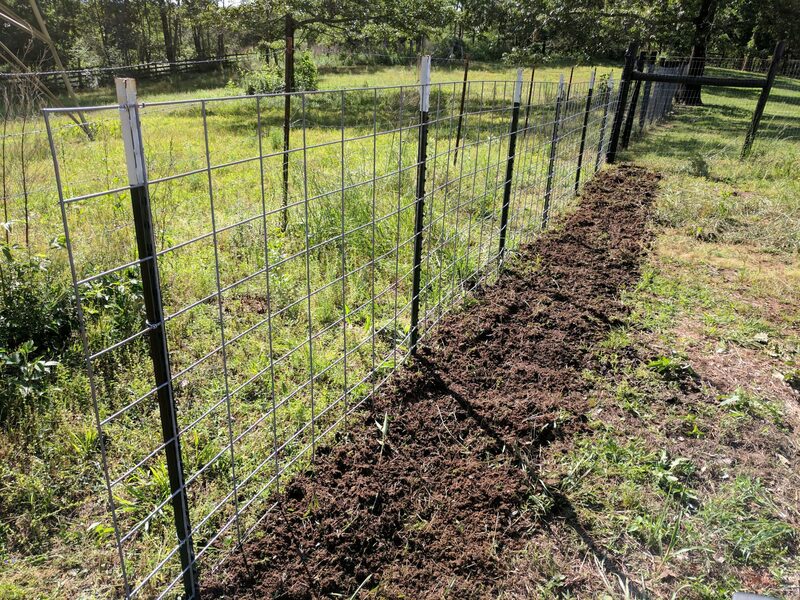 To prepare the soil we put down a layer of alpaca manure and covered with fertilized garden soil before tilling the combination into the seedbed. We cut the bottom off the fiber grow pots and planted the pots, every few feet, directly into the seedbed so that the top of the pot was level with the ground. We then filled in the pot with surrounding soil so that the seedlings were sticking up from the ground and the pots were buried. 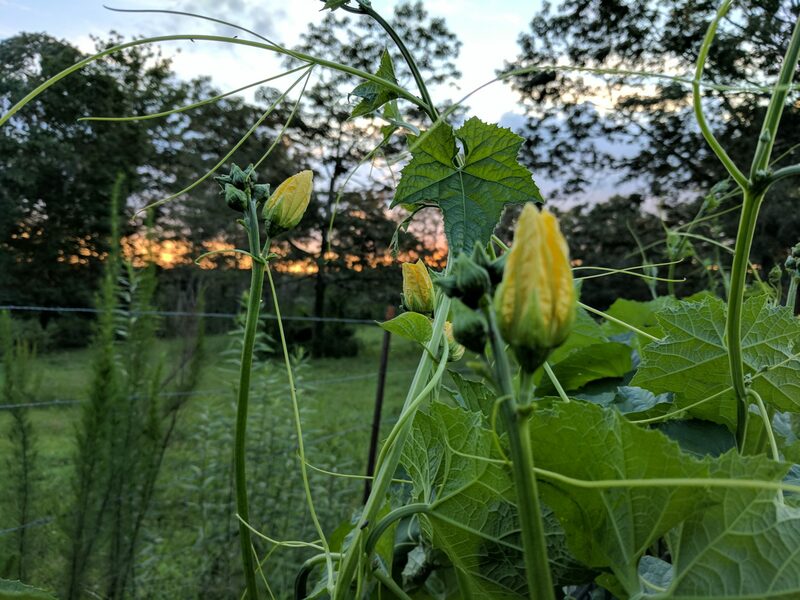 Be careful not to plant the luffa seedlings until ANY threat of frost has passed. After the seedlings grew for a week, we kept the strongest of the seedlings from each pot and snipped off the others at the ground. It's hard to tell from the photo, but we helped train the luffa vines through the cattle panel to guide their growth. After they reached the top, we removed the first four lateral branches of each plant (first 3 feet or so from ground) to increase the yield and quality of fruit. You also want to pinch off the first flowers that appear. 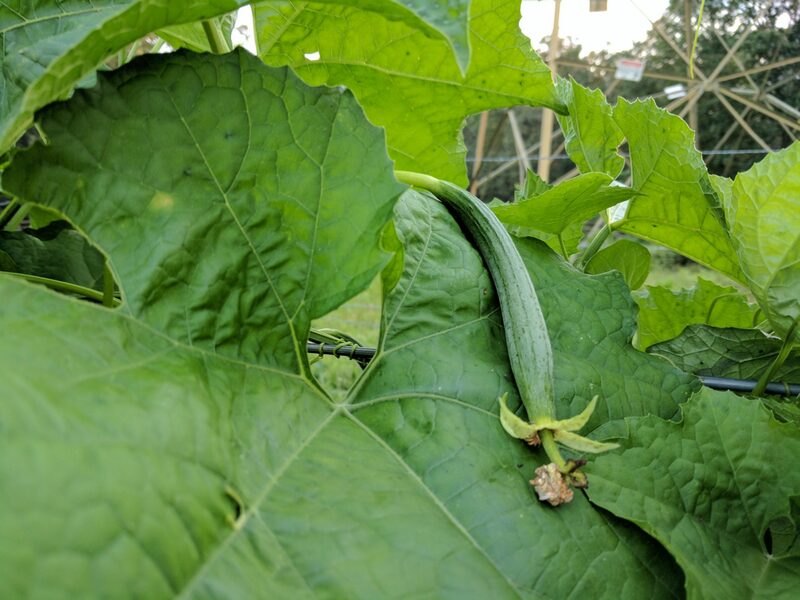 While it's important to make sure your luffa vines are watered, avoid overwatering established luffa plants, as excessive moisture, especially in clay soils, can cause root diseases and poor growth. If all goes well, you should have luffas on the vine in no time at all. It's important to let them stay on the vine until they dry out (and are much lighter). Sometimes they'll turn brown, but some are dried on the vine while still green. At the end of the season any remaining luffas MUST be harvested and brought indoors before the first frost. Otherwise, they'll start rotting at first frost and you won't have any beautiful luffas to show for all your work. If your luffa wasn't able to dry on the vine then it will take a little more work to peel off the outer skin. Try hitting it on the concrete to break open the green husk and work your finger between the outer shell and the inner fiber. After you've removed the outer shell, run luffas through the dishwasher to remove pulp. You can soak them in bleach water to remove any stains. Picture from November 6th (first batch that came out of dishwasher).